Gaudi, tapas, football. These are the words most likely conjured up when the capital of Catalonia pops into the head. But I wish to add another, beer! Yes, beer! You see, for quite some time Barcelona and regions across the Iberian Peninsula have been quietly shifting the gears and turning the wheels in a race witnessed the world over. The craft beer race. Adventurous new brewery’s appearing like Columbus on the shores of the new world, their arrival too leaves me full of surprises. 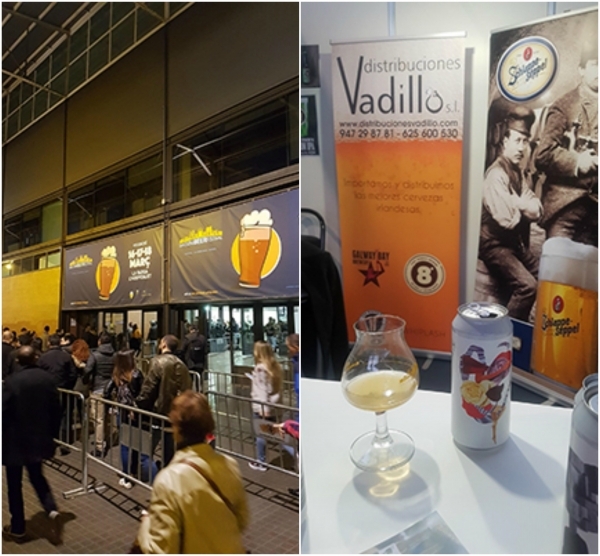 Our Spanish friends are not only producing some of the best beer found in Europe but also have some well-established craft brewery’s going back decades. And where better to showcases some of Ireland's best, than at Barcelona Beer Festival. Having touched down March 15th I had 2 days to get to grips with this beautiful city, where the way of life seems to be that little bit more relaxed and easy going, exactly how I found my welcome at NaparBcn. A brew pub close to the University serving an array of guest and house beers. The local selection was impressive, the quality to match. Coming here on business promoting Irish craft seemed even more challenging when I could taste first-hand the domestic competition. With that said, having 3 amazing Irish breweries , Whiplash Beer, Galway Bay and The White Hag in our corner gave me bullet proof confidence in our ability to impress our Catalonian cousins! A pit stop by the famous BierCaB where I can testify, had without a doubt the best tap selection I care to remember. A couple fresh small IPA’s granted me the ability to carry myself two blocks down to Brewdog Bracelona, who were hosting our friends from Whiplash beer. 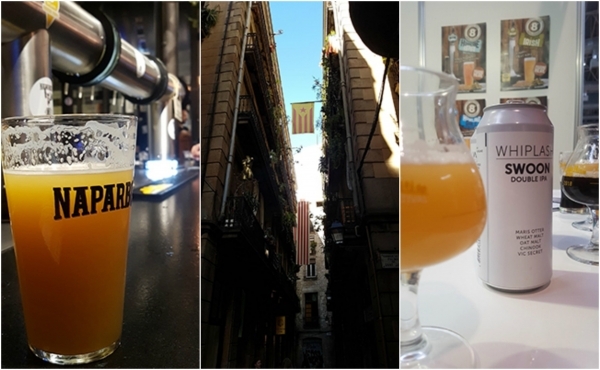 The menu board lit with Rollover, Bone Machine and Body Riddle, it beckoned me to the bar to find Alan and Alex in high spirits, insisting we drink pints of Drone Logic DIPA to begin with, I discard the notion that my first night in Barcelona would be a civil affair. An hour later I find myself in Garage Beer Co looking at the menu that clearly has a problem with sensible low ABV beers. Let’s just say the carnage had only just began and with it, the beginning of the end to my first 24 hours with Barcelona. Dawn light punches the room of my hotel and like a boxer struggling to rise for the final round I prepare myself for what day two has in store. A quick bite with my Honstbrew companions Cormac and Brody, we casually wander through the old city and back towards the scene of the crime, Garage Beer Co where a collab was brewing between Whiplash and their host. I can only imagine what is in store when this beer is released…….. 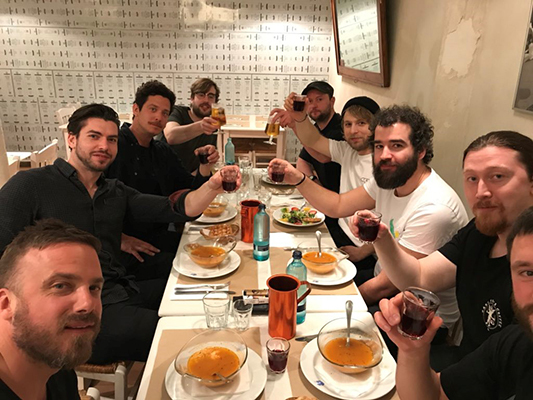 Some lunch, laughs and a few cans of Session IPA in our system we got a few taxis to ferry us to Barcelona Beer Festival. Arriving somewhat early, I took a quick walk across what can only be described as a vast aircraft hangar and below greeted by a 30-foot-tall chalkboard displaying 150+ beers pouring all at once. A sea of chat, clinking glassware and bells ringing with every new arrival of a fresh beer tapped, scanning the board for a personal favourite of mine, The White Hag Bourbon Black Boar. Opting instead to fill my glass with a lifesaving Lambic, I decide to make my presence felt at the trade stand. Shake some hands, rub the odd shoulder and pray the mornings extra espresso will save me from a personal Spanish inquisition. I need not to have worried because when you are sipping on savage beers be it Galway Bay’s Weighs & Measures or the delectable new DIPA Swoon by Whiplash it allows the beer to do the talking and tossing aside any language barrier. Its why we love the beer game. As the evening closed in, I stood waiting patiently for the bell to sound, hoping to see a Galway Bay Althea, Whiplash Body Riddle or a refreshing Puca Berry appear in black and white above our heads. Spending the last few hours in BBF’s warm embrace I bid fair well and venture out for one last bar hop and as the late Spring night slowing crept through the streets of this magical city it dawned on me that beer scene here has many more secrets to discover. If only I had 72 hours more with Barcelona.